The injury we all feared, the injury the club must have feared and the injury even the player himself would have surely feared – Alexis Sanchez went off holding his hamstring. Few things about this entire episode that sums up the fan base at the moment . If you are fully behind Arsene Wenger, you have to defend every decision he makes and if you think it’s time for him to move on, then you criticise every decision he makes. 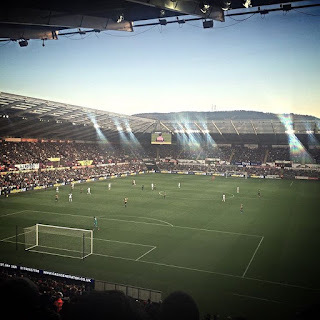 Since when was football so black and white – you can still be behind Arsene Wenger but have a differing opinion or think he has made a mistake – it is allowed! I wouldn’t consider myself an AKB (Arsene knows best) or a WOB (Wenger out Brigade) despite what most people probably think but I do admire what he has done at our football cub and want him and the club to be more successful and really push Arsenal to a title challenge and perhaps even winning it. Having said that, I will not defend every decision the man makes – how can any human being, in their professional life, get every decision right? I certainly do not in my line of work. I think the decision not to take Alexis off last week against Zagreb when 3-0 up was the wrong one – there I said it, but I believe it really was! The justification was that Giroud was carrying an knock, Santi Cazorla has been extremely jaded and Hector Bellerin had a slight injury so all three went off which meant Alexis could not. Alexis then moved central so he does not have to work and track back as much as you do on the flank. My thinking in that would have been to take Alexis on and keep Santi Cazorla on – knowing that Aaron Ramsey was back and could start on Sunday. The centre of midfield suddenly had options again and seeing Joel Campbell have one of his best games for the club, I would have had no problem in playing Campbell right, Alexis (after only playing 70mins against Zagreb) left with Ramsey in the middle instead of Cazorla (if he was not fit enough to pay) knowing that Alex Oxlade Chamberlain was also on the bench. Yes, it would be a risk keeping Santi on but keeping Alexis on was a bigger one due to the impact he has on the team and the lack of (quality) options in his position. 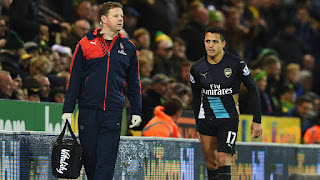 The Alexis injury reminds me of the Nasri hamstring injury a few years ago when he had about 20 days until ‘that’ Barcelona game at the Emirates and was in a race to be fit and made it and was involved in the winning goal. For Alexis, if the injury is a simple hamstring pull, the city game will be the one he is looking at. Alexis seems (no basis or evidence but on first look) that he recovers from injuries quickly purely because of the way he is so here’s is hoping that he will be back as quickly as possible. But for now, as disappointing as the last three league games have been, all is not lost and I’m hoping the squad recover and Arsene gets the team back on winning ways - but that doesn’t mean he will get everything right and more importantly, doesn’t mean pro Wenger supporters have to justify every single decision he makes….only human guv. This week's blog is more a podcast and it features a conversation with the Daily Mail / Sunday Supplement's Neil Ashton. The man who's famously used the term 'nicking a living' when referring to Mesut Ozil in a game away to Bayern Munich in the Champions League. I asked him about that article wanted to question him on it and we spoke about the article and Ozil's Arsenal career to date. 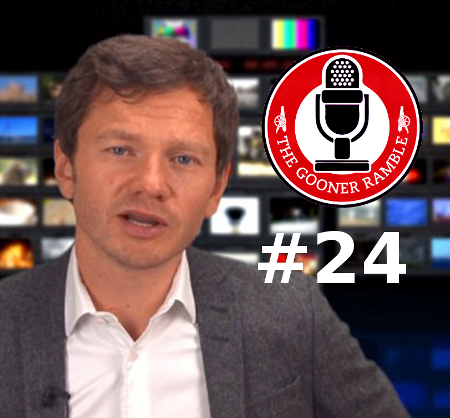 We also talk about Giroud who Neil has a strong opinion on along with Arsene Wenger and what he is like at press conferences (including the famous 'Why you look at me') and what he is like away from Arsenal. Well worth a listening - even if you dislike Neil Ashton. The whole podcast idea with him started after that Munich game when I saw him at the emirates as I sit near the press box - I found myself defending Mesut Ozil and Arsenal and the idea of recording a chat came from this. I was sure to make sure I choose when we record and I waited until there could be no debate on Ozil's performances and he is one of the hottest players in the league on current form. Arsene Wenger recently talked about breaking up the first half of the season in parts. Using the international breaks as dividers and setting targets for these periods. Arsenal currently sit joint first (I prefer to say that then second – it’s currently joint first but turns into second on the final day of the season) and their Premier League form has been pretty good. 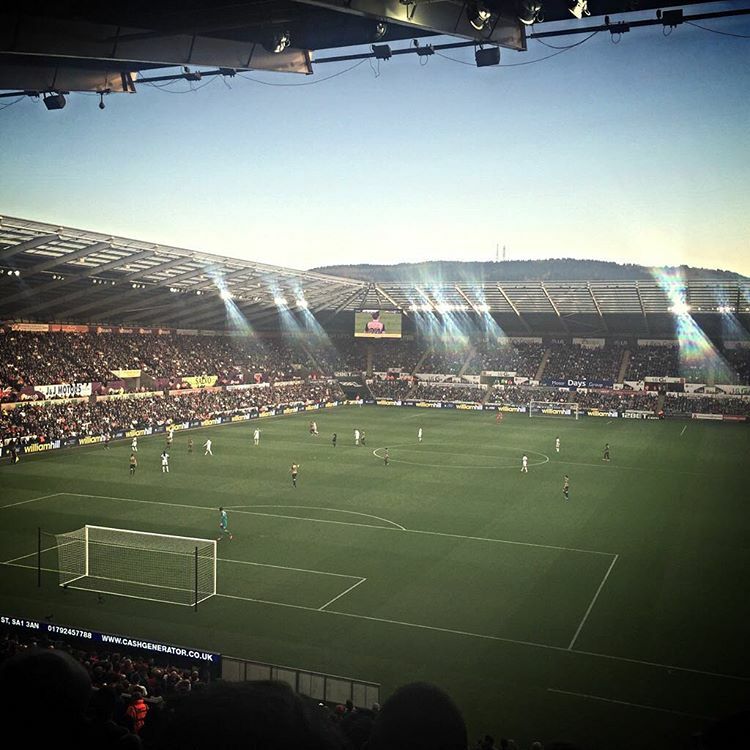 Good wins against Manchester United at home, Swansea and Palace away being a personal highlight. Frustrating games against Liverpool and Chelsea where there is still a sense of disappointment and slight regret. You can draw as many conclusions as you want this season but the one I have come to is that if Arsenal are to maintain a title challenge, then injuries (or hopefully the lack off) will play a huge part. In fact, injuries will determine if Arsenal maintain their title challenge – despite not buying an outfield player (which 99.9% of supporters were at unease about) the squad, if fit, look in good shape. There is the worry about Francis Coquelin but if you look at the team that played at home against Spurs, you would say at the very least, three players would come into the team – Bellerin, Ramsey and Walcott (perhaps two if Giroud plays upfront) but the main difference would have been the bench. The strength on the bench was nowhere near where it should be and having a few players back would have resulted in Ramsey or Wilshere coming on for Santi with Bellerin for Dubuchy (although, Bellerin would have started if fit) and the Ox, Theo or Welbeck or even Rosicky (if he ever comes back) on to play the Gibbs role. The Bayern Munich game at home was a great example of what you do with a half decent bench. Theo Walcott was running at Bayern the entire game but Arsenal had Giroud to come on to provide a different option; but one with quality (rather than throwing on a Bendtner or Sanago like we have in previous years). Similar when Aaron Ramsey pulled a hamstring, Arsene Wenger could call on Alex Oxlade Chamberlain to come on rather than our second choice left back (who we love at the moment after his leveller against that lot’). Our next game is away to West Brom and our squad of 18 should include Bellerin, Ramsey and Chamberlain and a fully rested Mesut Ozil who has not been called up for Germany. They probably recognise he needs a rest and it's a perfect situation for us. Alexis Sanchez does remain a worry and we pray he gets through the internationals but looking ahead, I wonder if the temptation to rest him against Zagreb (I know it’s the Champions League but….) will be there or perhaps the home game in the league to Sunderland in early December but he looked exhausted on Sunday in the last 20 minutes after a tough week. The injury to Theo Walcott is the one I’m most interested in – I thought he was developing very well in the centre forward role and along with Giroud provided us with two very good options. We may not have a worldie but in Giroud and Walcott, they could just perhaps, score enough goals to give us a shout in the one we all want - the Premier League. But for the love of god, please no more injuries.